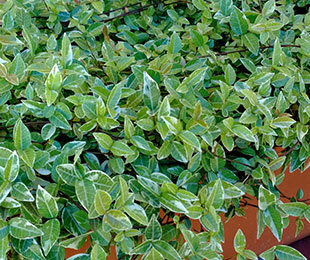 The white and green variegated leaves of Shooting Star™ Star Jasmine makes it an excellent feature. Only gets half the height of the common form. Used as a ground cover, climber, or for containers and borders. 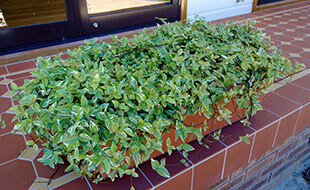 Description: Shooting Star™ Trachelospermum is a variegated Star Jasmine that only gets half as tall as the common form. Small fragrant white flowers make this plant stand out that little bit more in summer and autumn. Size: 20-40cm high x 1.5m wide. Uses: An excellent feature in landscapes as a ground cover, climber or for containers and borders. Position: Full sun to part shade. Tolerates drought and cold. Suits most soil types. Care: Water as required for 8-13 weeks until established. Plant in a well mulched garden (chunky mulch is recommended). If required use slow release fertiliser in spring. Prune after flowering. Although it can tolerate drought, it is best to keep moist in dry weather. Where it works: QLD, NSW & WA.